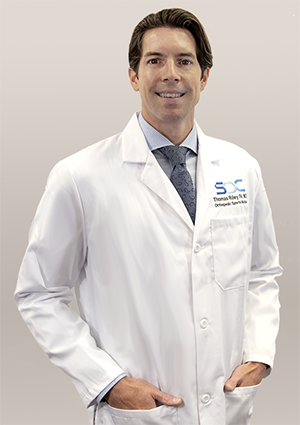 Dr. Thomas Riley is an acclaimed orthopedic surgeon specializing in sports medicine now practicing in South Florida and part of our elite team of physicians at Spine & Orthopedic Center. Encouraged by a strong passion for sports and science, Dr. Riley graduated from the Temple University School of Medicine in Philadelphia, PA. He then completed his Orthopedic Surgery Residency at Marshall University Department of Orthopaedics in Huntington, WV followed by a fellowship training in Orthopaedic Sports Medicine at the Miami Sports Medicine Institute. Dr. Riley treats a broad scope of orthopedic conditions such as arthritis, fractures, joint fractures and dislocation, tendon ruptures, ligament injuries and many other upper and lower extremity ailments among others. Furthermore, his extensive training has provided him with the skills to perform a number of surgical procedures including total and partial joint replacement, upper and lower extremity fracture care, joint arthroplasty, tendon and ligament reconstruction/repair, and much more. During his time in Miami, Dr. Riley had the opportunity to provide team medical services to the Miami Dolphins and Miami Heat, along with other local sports teams such as the basketball and soccer teams at Florida International University. This exposure to high ranked sport teams helped Dr. Riley in gaining invaluable experience in treating some of the world highest level athletes. Through his fellowship training, Dr. Riley also acquired experience in advanced techniques in arthroscopy including rotator cuff repair, labral repair, shoulder instability procedures, elbow arthroscopy, knee arthroscopy, meniscus repair and ACL and PCL reconstruction. He also has experience in a broad number of tendon and ligament repair techniques for injuries including biceps, pectoralis, patellar ligament, quadriceps, MCL and LCL, and Achilles tendon ruptures. Dr. Riley will be seeing patients in all four of our offices in Broward and Palm Beach county. To schedule and appointment with Dr. Riley, please contact us at 888-409-8006. Riley, TD, Mooar, P, Gaughan, JP. The Incidence and Contributing Factors of Partial Cartilage Delamination Injuries in the Knee.